A valuable and spiritual artifact is returned to the Thai National Museum, generating interest from a ruthless underworld gang. When the gang's attempt to steal the coveted "Kris of Kings" is thwarted by the curious Tae Yang (Tae-joo Na) and his family, the gang vows to take revenge on those who dared to stand in their way. Acclaimed martial arts director Prachya Pinkaew (Ong-Bak, Chocolate) returns with The Kick, comedic new action comedy featuring JeeJa Yanin (Chocolate, Raging Phoenix), Jae-hyeon Jo (Bad Guy, The Isle, Crocodile), Petchtai Wongkamlao (Ong-Bak, The Bodyguard, Warrior King) and Ye Ji-won (Turning Gate, Ha Ha Ha). Opinion is a little mixed on the film itself, though BeyondHollwood.com called it "a fun, fast paced and action packed film, and one which should definitely be enjoyed by any fans of the recent wave of Thai martial arts cinema, or genre aficionados in general." We've not seen it yet so couldn't possible comment. 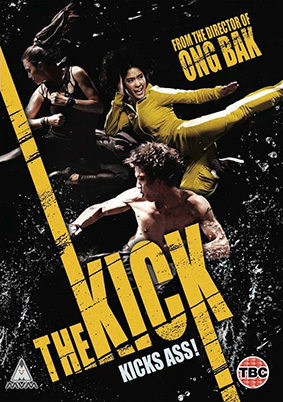 The Kick will be released on UK DVD (no Blu-ray?) on 7th October 2013 by MVM at a yet to be confirmed RRP. And there are no extra features, apparently. Not even a trailer...?